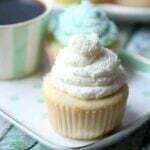 Easy white cupcakes flavored with almond and vanilla are moist and tender. They'll taste great with any icing but try this whipped cream cheese icing - it's an amazing combination! Combine the flour, baking powder, and salt in a bowl - set aside. Cream the butter and sugar together until fluffy, about 4 minutes. Add the sour cream, almond extract, and vanilla-butternut flavoring. Add the egg whites and beat well, scraping down the bowl often. 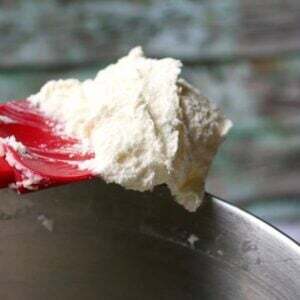 Add the flour mixture to the egg white mixture in 3 batches, alternating with the milk. Beat on low speed for a minute, scraping down the sides to ensure all the ingredients are incorporated into the batter. Fill the cupcake liners 2/3 of the way up. Bake for 20 minutes, or until a toothpick inserted in the center comes out clean with a few crumbs clinging to it. Remove the cupcakes from the oven and let cool 5 minutes before removing from the pan. Beat the cream cheese, and Confectioner's sugar until fluffy. Add the cream, pudding mix, and almond extract. Beat until it thickens and stiff peaks form. Cupcakes may be frozen for up to 3 months unfrosted. Any leftover frosted cupcakes or frosting should be kept in the refrigerator.